Just when you thought trail running shoes couldn't get any better Adidas has pulled it out of the bag with anew range which include Boost technology. Boost is Adidas' cushion innovation,the company claim it provides more energy return than any other foam material in the industry. It's soft and responsive -- and doesn't lose its properties like standard EVA. 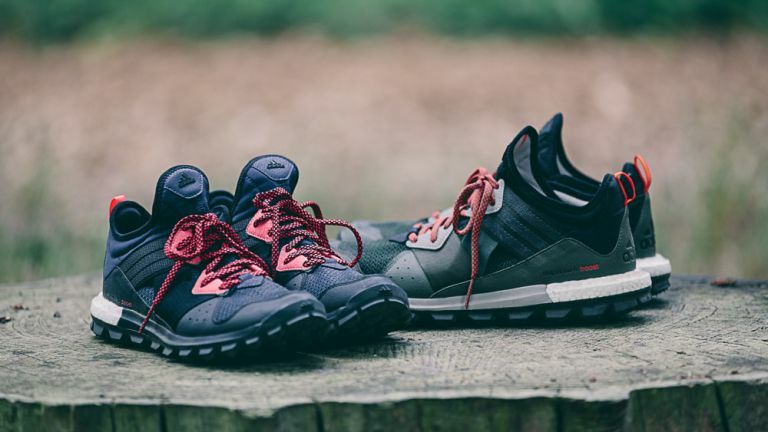 Interest and participation rates for trail running are at an all-time high, and Adidas are looking to revolutionise the landscape with three new additions to their range. First up we have the Adidas Response Trail Boost, designed by the Y-3 design team -- they certainly stand out from the crowd. The Response trail includes adaptive Traxion, a stitched tongue to protect from mud and dirt, a comfort layer system, and a Continental outsole. Next we have Adizero XT Trail Boosts, as the name suggests these are lightweight racers (weighing between 264 and 230 grams)which are designed to help athletes brake new performance barriers. The XT features durable laces (really), a protective toe area, and a Traxion outsole made of Continental rubber. Finally, there's the Adistar Raven Boost, which should allow athletes to run anywhere they want. The shoes react to changes in the ground and provides superior feel and transition. These include a speed lace system, ballistic welding for a protective fit, and Continental outsoles. Adidas are hoping these will be the king of trail running. The Boost trail range will be available from Friday (August 1), with prices starting from £90 for theResponse Trail, rising to £105 for the Adizero XT Trail and £110 for theRaven Trail Boosts. Looking for the best running shoes around? Check out our favourites here.